Beercicle Machine – The perfect way to serve bottled beer. Even better than draught beer on tap, although a glass inside an ice sleeve would serve draught beer nicely. I got the idea when I was in a café in hot and muggyThailand. I helped myself to bottled beer from their ice-cold fridge and ripped off an icicle from the fridge wall in the process, the icicle stuck to the side of my bottle. The beer chilled my teeth coming out and tasted deliciously cold. I imagined the big icicle would keep my beer nicely chilled for a while, when it occurred to me a fridge could be designed to create these popsicle sleeves which could have an insulating layer on the outside (perhaps foam) and shaped inside to snuggly fit a beer bottle (or glass for draught beer). I imagine it would not be a very complicated process, where the fridge could be fine tuned to be close to freezing, and perhaps some experimented and measured time how long the bottle must stay outside, to warm up slightly before opening. The trick is to open it at just above zero, when the beer itself will not turn to ice but the bottle/glass and surrounding ice is at zero. It will keep the beer to near zero without freezing it. 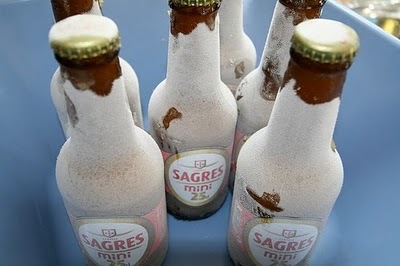 It has to get significantly cold for the beer to freeze while the bottle is still closed. So just avoid that and all should be okay. If you open the beer too soon the release of pressure will allow ice to form, destroying the beer that gets frozen. Some of my other ideas and inventions. Traveling around the world while working. This entry was posted on Tuesday, June 5th, 2012 at 9:21 pm and is filed under Other jumbles. You can follow any responses to this entry through the RSS 2.0 feed. You can leave a response, or trackback from your own site.